Here is a workshop where you not only will learn how to eco print on paper, fabric and leather, but also use the results into something useable. During the first two days of this workshop, you will eco print your own paper, eco print a cover on leather, and sew everything together into you personal notebook. 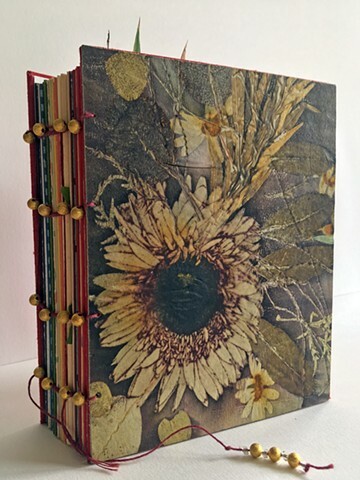 On day 3 and 4 we will really get into mixed media by combining fabric and paper into sheets with stitching, and eco printing these before we sew them into a second book. We will look at several options for a cover here. This book could become a wonderful record of plant material and media used. In this workshop we will learn about printing on paper and leather. Suitable papers and leathers will be discussed and tested. Suitable flora will be discussed. Methods of bundling and “cooking”.